Put simply, the model of state-run agriculture implanted in Cuba after the Revolution worked—albeit far from optimally—so long as the state had the means to furnish the imported equipment, spare parts, fuel, lubricants, fertilizer and plant chemicals on which producers had become increasingly dependent. When the Cuban economy lost its Soviet-bloc supports, the island’s state agriculture slumped. The common thread running through almost two decades of governmental initiatives aimed at adapting the state’s role in agriculture to the changed circumstances since the demise of the Soviet Union and Comecon is the attempt to revive Cuban farm production without ceding state control. In the manner in which these objectives have so far been pursued, they have proved to be broadly incompatible. The loss of foreign subsidies set in train the dethronement of the sugar agroindustry from its pre-eminence in Cuba’s economy. In the 30 years following Fidel Castro’s triumphant entry into Havana, Cuban sugar production had grown by 40% and exports by a third.2 During the second half of the 1980s, 53.2%, on average, of Cuban sugar shipments abroad went to the Soviet Union and a further 14.7% to other Comecon countries. As in prerevolutionary times, the sugar industry was, at the close of the 1980s, Cuba’s main foreign exchange earner, generating almost three-quarters of the total value of merchandise exports. Some 8 million metric tons of sugar were produced in the 1988/ 89 crop season, the last before the fall of the Berlin Wall, with more than 80% of the cane processed coming from state farms. Faultily restructured, and still governed by the state and without sufficient resources to renew its fabric, the industry has produced less than 1.5 million tons of sugar annually since 2005. The island’s physical landscape has also radically changed. Smoke no longer rises from the chimneys of nearly two-thirds of the sugar mills active in 1989, and roughly a million hectares have effectively gone out of sugarcane. Only a fraction of this land was planted with other crops as planned, however, and much of it became infested with marabú (Dichrostachys cinerea), a thorny, fast-growing shrub that forms dense thickets that are difficult to eradicate. “Against a background of high current and foreseeable food import prices, agriculture shows an unsatisfactory performance, with lower production of provision crops, vegetables, beans, citrus fruits, corn and other products,” the National Assembly’s Commission for Economic Affairs reported towards the end of 2006, pointing the finger at “subjective management deficiencies [and] a decline in labor productivity and also in the average hours worked” (Granma, 25 December 2006). Speaking seven months later at the annual 26th of July commemoration of the assault on the Moncada army barracks in Santiago, regarded as the beginning of the Cuban revolution, Raúl Castro caustically noted the verdant stretches of marabú he had seen all the way from Havana to Camagüey in the center of the island, the site of that year’s rally, and declared: “We face the imperative of making our land produce more. . . . the needed structural and conceptual changes will have to be introduced” (Granma, 27 July 2007). Another nine months later, he returned to the subject of agriculture, telling Communist Party leaders that food production was a matter of maximum national security on which they had to focus their attention (http://www.granma. cubaweb.cu/secciones/pleno-ccpcc/pleno01.html). Finally, on 10 July 2008, in what was, arguably, the most momentous step in the two years since Fidel Castro relinquished his presidential duties, Cuba’s Council of State emitted Decree-Law No. 259, setting out the terms for the transfer in usufruct of idle lands to individuals and corporate bodies (Granma, 18 July 2008). Though the transfers were hedged by a string of conditions (Decree No. 282, Gaceta Oficial No. 30 Extraordinaria, 29 August 2008), close to one hundred thousand applications were received by early 2009 (Lee, 2009), and Orlando Lugo Fonte, president of ANAP, the National Association of Small Farmers, was looking forward to welcoming more than 40,000 new members (Sáez Chávez, 2009). That small private farmers, on the whole, worked their land more intensively than state enterprises, i.e., cultivated a higher proportion of the agricultural land in their charge, has long been apparent from official statistics. So has a creeping increase over the past 20 years in the total amount of land under private management. But Decree-Law No. 259 opened the door to a structural shift—albeit in usufruct, not ownership— that dare not speak its name.5 Implicit was the abandonment of the long-held doctrine of the superiority of large-scale state or parastatal farming, of which Fidel Castro had been the foremost exponent in Cuba. A common feature of the major agricultural policy initiatives of the Cuban government since 1990, in what is known as the “Special Period in Peacetime,” is that they were introduced in moments of acute economic stress. However long in gestation, helter-skelter implementation at the point of being put into action stamped them as emergency measures when balanceof- payment and budget pressures moved domestic food production to the top of the government’s agenda. Yet the government was not willing to countenance an institutional environment in which food could be produced and marketed efficiently, nor assign the necessary resources. In effect, producers were expected to pull themselves up by their own bootstraps. The UBPCs were created in 1993 at the peak of the crisis caused by the loss of Soviet-bloc supports and in the wake of a 38.6% drop in sugar production to less than 4.4 million metric tons from 7.1 million tons the previous year. As succinctly put by Villegas Chádez (1996:116): “[T]he UBPCs arose out of a bankrupt business.” Classified as cane or non-cane depending on their main line of production, the cane UBPCs, in particular, were meant also to grow food for self-consumption and sale, to the benefit of their own and the nation’s economy, reminding Pollitt (1997) of colonos, the prerevolutionary independent cane growers cultivating their own or rented land. Similarly, the restructuring of the sugar industry was announced in the late spring of 2002 at a cyclical low point in world market sugar prices, after resources had had to be diverted to repair the heavy damage caused by Hurricane Michelle, and while tourism was suffering the negative effects of September 11 and of a global economic downturn. Nevertheless, the authorities held out the possibility not only of returning the national average per hectare sugarcane yield to its 1980s level but also of producing “up to 28 lines” of food and other products on land taken out of cane (Hagelberg, 2002). The latest big initiative—Decree-Law No. 259 on transfers of idle land—was promulgated in mid-2008 against the background of a sharp rise in food import costs and deterioration of the food export-import balance pressing on the merchandise trade balance (Table 1). The 1.2 billion peso deficit in the latter in 2007 constituted almost one-fifth of the total merchandise trade deficit of 6.4 billion pesos that year.6 The results from Decree-Law No. 259 will not become visible for a while. Although ad hoc land transfers have taken place for years, it is obviously still very much a work in progress. From the available evidence—to be further discussed below—it appears, however, that the preparations for a large-scale shift in tenancy arrangements were no more thorough than those for previous initiatives. Like the smaller Caribbean islands, Cuba is to a significant degree dependent on food imports because of dietary customs. Grains are by far the single largest item on the food import bill (ONE, 2009, Table 8.13) owing to the fact that bread is an essential part of breakfast, though wheat and rye cannot be commercially grown in the country, and no lunch or dinner is complete without rice, of which there is a domestic deficit. Nova González (2008a) calculated that the import component of the daily calorie intake increased from 53% to 58% and that of the protein intake from 59% to 62% between 1985 and 2005. The increased deficit in the agricultural product trade balance reflects in considerable part the decrease in sugar production and export availabilities after the industry’s restructuring (Table 2). The net income from the trade in sugar and related products has fallen below 200 million pesos, less than the net foreign earnings from the trade in tobacco products. Droughts and hurricanes have made it difficult to disentangle the effect of policies and management practices from the impact of natural phenomena on the performance of the agricultural sector. Multiyear averages of the output statistics for a variety of food crops and livestock products (Table 3) point to disparate trends, but all categories examined, except pig meat and beef, declined in 2006–08, compared with the previous three years. The annual figures underlying these averages show that in the 12 years to 2008 milk production peaked in 1998, beef in 1999, citrus fruits in 2000, cereals in 2003, provision crops, vegetables, beans, and other fruits in 2004, and pigmeat in 2008. Huge increases in the government-decreed producer prices for sugarcane, milk, meat and other farm products in recent times imply that the previous prices were unremunerative and a disincentive to production.7 A spectacular jump in the production of pigmeat in the last two years (ONE, 2009, Table 9.20) suggests that the vagaries of government may have been as important a causal factor in the uneven pattern of performance of the various strands of Cuba’s agriculture as the vagaries of nature. The surge in the delivery of pigs for slaughter provides a more recent example of the consequences of the absence of a systems approach to agricultural policymaking described in Hagelberg and Alvarez (2007): stateowned abattoirs, unable to handle the volume, renegued on purchase contracts; breeders had to continue to feed full-grown pigs, now at an unprofitable feed-tomeat conversion rate, and could not start fattening a new batch; the government-controlled price to producers was reduced, but not that charged the consumer; restaurants and retailers remained inadequately supplied; the underground market undersold state outlets; solution of the problem was made more complicated by government’s desire to recover part of a hefty subsidy; and while more than three months into 2008, some of the capacity bottlenecks had been overcome, it was still unclear how much the state had got back, through the sale of pork, of the 207.9 million pesos it spent in 2007 buying up pigs (Suárez Rivas, 2008). 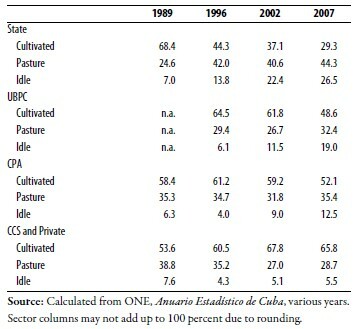 In total numbers, Cuba’s pig population increased by more than a quarter between 1997–99 and 2006–08 (Table 4). But three times that growth was experienced by the sheep and goat population, probably related to the expansion of the small private farm sector. In contrast, estimates of the chicken population do not show a clear trend, while cattle numbers have markedly declined, to the point of being overtaken by the stock of sheep and goats—and this in an agriculture pre-eminently stamped, by nature and historically, as based on grass: sugarcane and pasture, with more than 2 million hectares of the latter available for exploitation in recent years (Table 5). Given the central role of the state in the direction and management of the Cuban economy, such divergent trends and mixed results bring into question the connectedness and rationality of the government’s farm policies. A reduction by almost a third in the total cultivated land area, with the consequent release of labor, although not to the same extent. A two-and-a-half-fold overall increase in idle land. The decline by nearly a quarter in the agricultural land managed by CPAs, the older collective farms established in the second half of the 1970s by agreement between individual operators to pool their holdings and basic means of production. The 25% expansion of the agricultural land owned or leased by private farmers. The cultivated land area—defined as “area planted, in preparation, or resting or awaiting preparation for planting” and including tracks, ditches and headlands less than six meters wide—has decreased in all forms of tenancy, with the exception of CCS-associated and individual farmers (Table 5). From a closer look at the official statistics, it appears that behind the overall shrinkage by some 1.4 million hectares between 1989 and 2007 lies a fall by half from 3.6 million hectares to 1.8 million hectares in the area of permanent (i.e. perennial or occupying the land for more than 12 months) crops, whereas the temporary crop area increased from nearly 800,000 hectares in 1989 to roughly 1.2 million hectares in 2002, at which level it remained in 2007. The land area officially classified as idle grew between 1989 and 2007 by about 760,000 hectares, with 300,000 hectares of the increase occurring since 2002. All sectors—state, cooperative and private— experienced an increase, albeit at different rates. 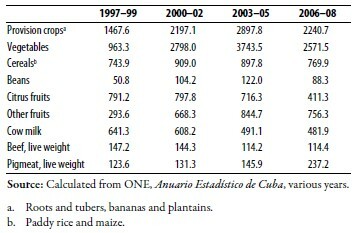 State enterprises were left with less than a third of Cuba’s agricultural land after the establishment of UBPCs in 1993, but they account for over half the total idle area (Table 6). Since then, the state’s share of agricultural land has begun to rise again, yet its share of idle land has declined, in contrast to the trends in the UBPC and CPA sectors. The figures indicate a considerable volume of land transfers between sectors. The CCS and individual farm sector has substantially grown in agricultural land, and even more in cultivated area, over the last two decades, in both absolute and relative terms. 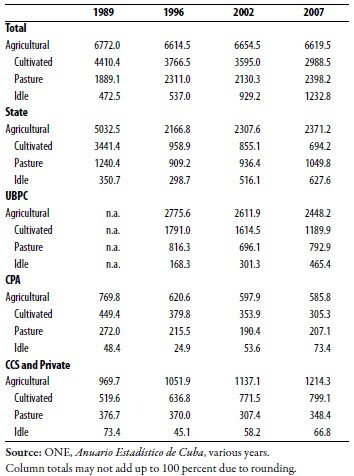 Whereas in the other three sectors the intensity of land utilization, evidenced by the ratio of cultivated to agricultural land, has declined, that of private farmers has increased, to the point of standing more than two to one above state enterprises in the most recent year for which data are available (Table 7). Lacking detailed local accounts of what happened across the country to the sugarcane areas affected by the downsizing of the industry since the early 1990s, it is impossible to gauge exactly how much this directly contributed to the increase in idle land. A further difficulty arises from the fact that accessible official sources no longer contain figures, national and provincial, formerly published in the government’s statistical yearbooks, for the cane areas “existent” (existente) each year, as distinct from areas “dedicated to” (dedicada a) cane. But it must be presumed that at least some of the land taken out of cane was put to other uses. This is confirmed by the available data: comparable figures for 1989 and 2002 show that the existent cane area decreased by slightly more than 480,000 hectares, but the idle land area only increased by not quite 460,000 hectares; similarly, between 2002 and 2007, the area dedicated to cane fell by 530,000 hectares, while the area of idle land rose by just over 300,000 hectares. Equally clearly, much of the land taken out of cane was not otherwise utilized. In order to explore further the relationship between areas of cane and of idle land over the entire period from 1989 to 2007, given the data limitations, the ranking (1 to 13) of the areas of cane existent in each province in 1989, derived from the corresponding statistical yearbook, was compared with the rank of the same province in 2007 in terms of its share in the national stock of idle land (ONE, 2008). This resulted in a highly significant Spearman’s coefficient of rank correlation of 0.857. How far the ONE figure of 1,233 thousand hectares probably understated the area of idle land at the end of 2007 has been fortuitously revealed by González (2009): “A study of the idle state lands arrived at 1,691 thousand hectares.”13 Deducting the difference of 458,000 hectares from the 2007 sugarcane area of 1,141 thousand hectares, in round numbers, on ONE’s books, brings the sugarcane area down to 683,000 hectares—within striking distance of the 700,000 hectares of sugarcane repeatedly reported by Marc Frank, the well-informed Reuters and Financial Times correspondent in Havana. As stated in its whereas clauses, Decree-Law No. 259 of 10 July 2008 was enacted in view of the existence of “a considerable percentage of idle state lands which makes it necessary to grant lands in usufruct to individuals and corporate bodies in order to increase the production of food and reduce its importation.” To this end, it was decreed that landless individuals could obtain up to 13.42 hectares and existing landholders could bring their total area up to 40.26 hectares under licenses valid for up to 10 years and successively renewable for the same period. Existing state farms, cooperatives and other legal entities could apply for the usufruct of an unlimited area for 25 years, renewable for another 25 years. Usufructs granted to individuals were transferable only exceptionally, because of age or illhealth, at the proposal of the holder, to another person working on that land and approved by the authorities. Individual usufructs would be subjected to a land tax and would cease on the total incapacity or death of the person, continued nonfulfillment of production contracts, failure to use the land rationally and sustainably and to protect the environment, acts contravening the purpose for which the grant had been made, abandonment of production for more than six months, revocation for reasons of public utility or social interest, and illegal transfer to third persons. Implementing regulations were to be issued by the Council of Ministers within 30 days, the Ministry of Finances and Prices being given unlimited time to pronounce the land tax. These regulations came—somewhat late—on 27 August 2008 (Decree No. 282, Gaceta Oficial No. 30 Extraordinaria, 29 August 2008) and in five chapters set out the rules concerning the compilation of the stock of idle land eligible for usufruct grants; the duties of the provincial and municipal officials of the Ministry of Agriculture and its agency, the National Center for Land Management; the requirements to be fulfilled by individual and corporate applicants; the procedures to be followed in making and rescinding the grants; and the content of the agreement between the grantee and the local Agriculture official. Among the conditions to be satisfied by individual grantees are compliance with product delivery contracts, “to abide by a moral and social conduct in accordance with the ethical principles of our society,” to join the local credit and services cooperative,15 and obtain its backing for the application. Curiously, the tenor of these documents spoke of a greater concern over retaining administrative controls than over enabling farmers to bring idle land back into production and boost the food supply. Besides the impression of an undiminished dirigiste mindset, the way the legislation was introduced invited the question why such an important measure was not presented to the National Assembly, constitutionally the “supreme organ of state power,” which met in one of its two regular annual sessions on 11 July 2008, just one day after Decree-Law No. 259 was dictated by the Council of State. A reluctance to submit a draft of the law to parliamentary scrutiny was perhaps induced by memories of the lengthy process of debate and amendment that preceded adoption of the law of agricultural production and credit and services cooperatives of 2002, in the drafting of which the ANAP is said to have been the major player, and modifications came from deputies and farmers “who were not hesitant to voice their opposition to certain parts of the bill” (Roman, 2004). 110,463 persons had appeared in the municipal offices of land management with requests for land. Some 31,000 asked for land not contemplated in the law and were redirected. For various reasons, 16,934 persons withdrew their applications. Of the 93,529 applications pursued, 78,113 had been approved and 2,383 rejected on various grounds. The adverse decisions resulted in 645 appeals, of which 594 had been resolved, 187 wholly or partly in favor of the applicant. 65,324 successful applicants had joined credit and services cooperatives, and 55,995 were producing and had concluded contracts with the state. A study of idle state lands put the area at 1,691 thousand hectares, of which 689,697 hectares, 41%, had been transferred. 25.4% of the idle land transferred had already been planted or was otherwise used, notwithstanding the fact that two-thirds of the area transferred was infested with marabú. But 187,632 hectares had already been cleared by the new users. One reason for delays was that much of the land had to be surveyed before it could be transferred. Some additional insights into the program can be gathered from earlier reports. Citing the director of the National Center for Land Management, Pérez et al (2009) revealed that more than 80% of nearly 56,000 grants approved by the fourth week of March had gone to persons previously landless and only 16.7% to individuals who were expanding their holdings. A breakdown of the principal activity for which land requests were made showed that of 69,086 applications received up to 20 October 2008, 41.7% were to hold cattle, 40.9% to grow mixed crops, 7.7% for small livestock, 6.5% to produce rice, 3.1% for coffee and tobacco, and less than 0.2% to grow sugarcane (calculated from Ministry of Agriculture figures in Nova González, 2008b). The overwhelming majority (98%) of applications came from individuals, of whom 79% had no land, and only 2% from corporate bodies, chiefly credit and services cooperatives. The primary interest to acquire land for livestock and mixed crops was confirmed in subsequent provincial reports. Certainly, by all accounts, a large number of requests for land have been granted and a substantial area has been transferred under the program. Putting to work underutilized land and labor is bound to boost the overall food supply. A considerable part of the increase, however, will go, in the first instance, to personal consumption which, in certain categories, absorbs a significant proportion of total production. Moreover, the resolve of the new farmers was being severely tested by the conditions under which they have to labor. Decades of experience notwithstanding, Cuba’s policymakers evidently still believe that they can will the end without willing the means. An investigation by a team of Juventud Rebelde reporters in March 2009 (Pérez et al, 2009) unearthed multiple complaints— lack of hand tools, machinery and fuel, insufficient financial support, uncertainty over whether even a shelter is permitted on the plot, shortage of fencing wire, and bureaucracy—along with concern over the technical unpreparedness of people new to farming. Many essential inputs are only obtainable for convertible pesos (CUC), the currency circulating domestically in replacement of the US dollar, but there was as yet no facility providing small loans in CUC (Nova González, 2008b). Whatever the material fruits of Decree-Law No. 259, the addition of tens of thousands of new operators to the private farm sector is of major political and social import. It furthers the rejuvenation of the rural population that began in the 1990s (Espinosa Burquet, 2004; Figueroa Albelo, 2005). It tends to reinforce the self-awareness and sense of identity of small farmers as a group. And it increases the political clout of ANAP, whose membership, said to have numbered 327,380 landholders and their relatives in 2005 (Figueroa Albelo, 2005), sees the inflow of more fresh blood. But while new smallholders were tackling the marabú, in some cases with nothing more than a machete, a shortage of boxes and transport to move crops from the field to consumers and processors—this time, a bumper crop of tomatoes—was heaping fuel on mounting anger at the government’s failure to reform the state-run farm product procurement and distribution system. The manifold weaknesses in the chain between producer and user—particularly of Acopio, the main link—have been a long-standing source of dissatisfaction, unassuaged by repeated organizational tinkering (Hagelberg and Alvarez, 2007). Before the tomatoes (Carrobello, 2009; Martín and León, 2009a; Pérez et al, 2009), it was guavas (Mayoral and Lee, 2008) and pigs (Suárez Rivas, 2008) that served in media reports as cardinal examples of widespread inefficiency, outright waste, and financial loss to producers. 17 In sum, it was a “mechanism that, for one reason or another, has failed pitifully in recent years,” Varela Pérez (2009a) wrote with unaccustomed acerbity. Manifestly, the promise of structural and conceptual changes remained to be fulfilled. In the latest reorganization, Acopio passes from the Ministry of Agriculture to Domestic Commerce, the former to attend to production, the latter to distribution (Carrobello, 2009; Martín and León, 2009b). The new system was to be rolled out experimentally in the city and adjacent province of Havana from 1 August 2009. What appears to be on the way is the creation of a new farm product marketing company under the domestic commerce ministry to service Havana city and province through a series of central markets (Varela Pérez, 2009b). To judge from the information available—not even the transport division’s truck drivers were well-informed, no greater opening to private intermediaries is contemplated; on the contrary, one of the goals seems to be eventually to curb private enterprise by improving the state’s competitiveness in terms of the variety, quality and prices of the produce on offer in its retail outlets. No encouragement is given to the small entrepreneur with the white van who constitutes a key link between producer and consumer in other parts of the Caribbean and across the world. Whether—with bureaucrats, rather than the market, determining prices and defining the demand for perishable products—this initiative amounts to more than a rearrangement of the furniture is questionable. While mere reorganization may produce some gain in efficiency, it is difficult to see where the capital will come from, without opening the door wide to private domestic and foreign investment, to bridge the shortages of hardware—from containers and vehicles to storage, refrigeration and processing capacity— blocking the way to a decent and affordable food supply. Or is it the ambition that the Cuban brand of socialism, perhaps along with North Korea’s, be for ever able to boast the dubious distinction of having the longest- living ration-card? How the issues underlying this question are resolved will also profoundly influence the further evolution of private agriculture in Cuba, a heterogeneous sector composed of differently sized and situated operators—owners, tenants, sharecroppers and smallholders. One thing is certain: by its incoherent policies, the regime has made a rod for its own back. 1. We are grateful to Marc Frank, B.H. Pollitt and J.P. Rathbone for useful comments on an earlier draft but are solely responsible for remaining shortcomings. 2. The production and export data in this paragraph have been compiled from various issues of the official Anuario Estadístico de Cuba and returns to the International Sugar Organization. Unlike the exogenous shock suffered by Java’s sugar industry in the 1930s when India and Japan, previously its main customers, developed their own supplies, the dissolution of the Soviet Union and of Comecon did not spell the disappearance of physical markets, save for the politically constructed outlets for Cuban sugar in formerly socialist central European countries which themselves were traditional sugar exporters. Russia has continued to import sugar from Cuba, but Brazil is nowadays by much the largest foreign supplier. What Cuba lost were negotiated prices far above the world market level. 3. Where to locate the UBPCs on the public-private sector spectrum is open to debate. Cf. Pollitt (1997): “part worker cooperatives, part collective farms . . . on lands leased in perpetuity from the state . . . . largely modeled on the Agricultural Production Cooperatives (Cooperativas de Producción Agropecuaria, or CPAs) that had been fostered among private farms since 1977”; Burchardt (2000): “a dual entity halfway between the state enterprise and the true cooperative”; Enríquez (2000): “an intermediate form of organization located somewhere between state farm granjas [state enterprise units] and CPAs”; Espinosa Burquet (2004): “a new type of [semi-autonomous] state cooperatives”; Molina Díaz (2007): “semi-private cooperatives”; Roman (2004) cited Orlando Lugo Fonte, president of the National Association of Small Farmers (ANAP), to the effect that since their land was state-owned, UBPCs were not considered to be agricultural cooperatives, did not belong to ANAP, and were not covered by the laws regulating agricultural cooperatives. However, Cuban statistics assign the UBPCs to the “non-state sector,” together with CPAs (officially defined as “a collective form of social ownership” of the land and other basic means of production), credit and service cooperatives (Cooperativas de Créditos y Servicios, or CCSs, in which “ownership of each farm, its equipment and the resulting production remain private”), scattered private farmers, and domestic plots. The problems of UBPC governance and management, particularly of the units primarily growing sugarcane, were discussed and extensively referenced in Hagelberg and Alvarez (2006). 4. These numbers put into perspective the government’s programs of urban market gardens and to encourage the cultivation of vacant plots elsewhere, which have received much attention also outside Cuba. The measures have unquestionably improved the supply of fresh vegetables and herbs, saved transport and storage, provided gainful work for unemployed and retired persons, and made shopping easier for urban consumers. But they have clearly not solved the wider problems of the agricultural sector. 5. In October 2008, the Chinese Communist Party announced a reform of the existing system of collective village ownership under which individual families were assigned, by household registration, small plots of land to use as they saw fit. Henceforth the government would establish markets where farmers can “subcontract, lease, exchange or swap” land-use rights or join cooperatives, paving the way for the establishment of larger, more efficient farms (New York Times, 19 October 2008). Table 1. Exports and Imports of Food Products and Live Animals by Standard International Trade Classification (million pesos) 2003 2004 2005 2006 2007 2008 Exports 440.0 459.9 273.7 323.0 325.8 340.3 Imports 857.0 1034.1 1316.9 1259.3 1548.9 2206.0 Balance -417.0 -574.2 -1043.2 -936.3 -1223.1 -1865.7 As a % of total merchandise exports or imports respectively Exports 26.1 19.7 12.7 11.0 8.8 9.2 Imports 18.3 18.4 17.3 13.3 15.4 15.5 Source: ONE, 2009, Tables 8.10 and 8.11. 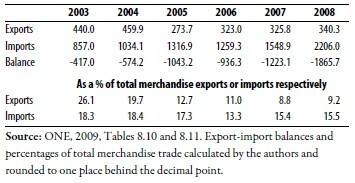 Export-import balances and percentages of total merchandise trade calculated by the authors and rounded to one place behind the decimal point. 6. Cuba’s trade in beverages and tobacco showed a growing surplus of exports over imports in the six years to 2007. However, inclusion of this category would not fundamentally alter the picture of a rising agricultural product trade deficit weighing on the balance of payments. 7. To stimulate milk and meat production, for instance, the finance and prices ministry raised the maximum state procurement prices for top grades to 2.53 pesos a liter of milk and 8.90 pesos a kilogram live weight of beef, from 1 July 2007, about two and a half times their previous levels, without increasing the controlled retail prices, which meant additional state budget support for these products (Núñez Betancourt, 2007). 8. The other major factor is an apparent reclassification of the pasture and forage area. For 1989, 1,081,700 hectares are listed under permanent crops in the cultivated land area and 1,240,400 hectares as “natural pasture” in the uncultivated land area. The corresponding figures for 2007 are 230,500 and 2,398,200 hectares. 9. The initial, 2002, phase of the restructuring also entailed the relocation of about 100,000 workers, of which half on the field side of the industry, according to official statements at the time (Hagelberg, 2002). The further downsizing of the industry thereafter presumably made more sugar workers redundant. 11. Across the world, the conventional metrics of land utilization by sugarcane are “area under cane” and “area harvested” (Blume, 1985). 12. The statistical yearbook reported the somewhat higher figure of 1,378,000 hectares, in round numbers, for the area in existence at the end of 2000 and 1,007,000 hectares for the area harvested in 2000/01. 13. A still higher figure of roughly 1770 thousand hectares for the total area of idle land can be derived from Raúl Castro’s speech on 26 July 2009 (Granma, 27 July 2009): the nearly 82,000 requests for plots under Decree-Law No. 259, approved to date, comprehended some 690,000 hectares, or 39% of the idle area, he said. 14. And so, from hour to hour we ripe and ripe,/And then from hour to hour we rot and rot,/And thereby hangs a tale. Shakespeare, As You Like It, II, vii. 15. By Ministry of Finances and Prices Resolution No. 36 of 28 February 2008, credit and services cooperatives became responsible for withholding 5% of payments made to small farmers for their products on account of personal income tax and forwarding the proceeds to the treasury. 16. “Una cosa es el plan, y otra la realidad de la vida.” Lázaro Díaz Carballo, member of the Havana province bureau of ANAP (Carrobello, 2009). 17. In addition to farmers’ complaints of financial loss when tomatoes, contracted to be grown for fresh consumption at one price, had to be sold for processing at a substantially lower price because they had become overripe when Acopio failed to pick them up in time, Carrobello (2009) highlighted the anger of garlic growers provoked by the finance ministry decision reducing the price of garlic by a third in the middle of an abundant harvest. While understandable because the decision went counter to the government line of “make all you want so long as it is from honest work,” the reaction also suggests that after some 40 years of state price controls, farmers have become unaccustomed to a market in which prices can go down as well as up, as they would when a glut hits a supply-and-demand-ruled market. If so, it is a state of mind that not only may make farmers hesitate to grow more food beyond what is needed for their own use and can be sold at high prices, but also spells problems for a future government that will have to wean producers—and consumers—off the idea of an all-singing (albeit off-key), all-dancing (albeit flat-footed) nanny state.